LOS ANGELES (AP) Clayton Kershaw is one step closer to a return with the Los Angeles Dodgers. Kershaw pitched a four-inning simulated game Saturday, raising the possibility that he could be back in their rotation next week. The three-time NL Cy Young Award winner has been on the disabled list nearly a month with left biceps tendinitis. Kershaw got up and down, mirroring game conditions, and pitched to Cody Bellinger, Chase Utley, Austin Barnes and Enrique Hernandez. 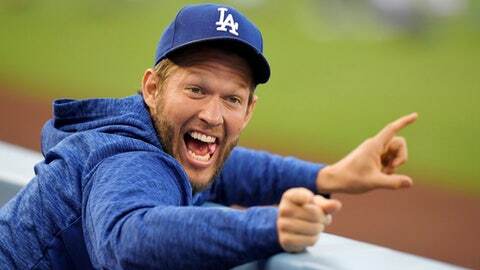 Kershaw is 1-4 with a 2.86 ERA this season. It’s not certain he’ll pitch in five days, when the Dodgers play Philadelphia in the finale of a 10-game homestand. Dodgers manager Dave Roberts, who watched the workout with Andrew Friedman, the team’s president of baseball operations, wants to see how Kershaw feels before determining when and where he will pitch next. Roberts had not yet talked to Kershaw before speaking with reporters. Through this stint on the disabled list, Kershaw found himself examining his mechanics. Kershaw declined to explain what motivated him to focus on mechanics. The 30-year-old left-hander was positive about where he’s at now. Kershaw hadn’t felt as positive following his previous bullpen, but he was encouraged Saturday. ”You can’t simulate a big league game. All the things you do to prepare to pitch a big league game, you really don’t know where you’re at until you’re in one,” Kershaw said. The Dodgers, who were one win away from the World Series title last year, are below .500.